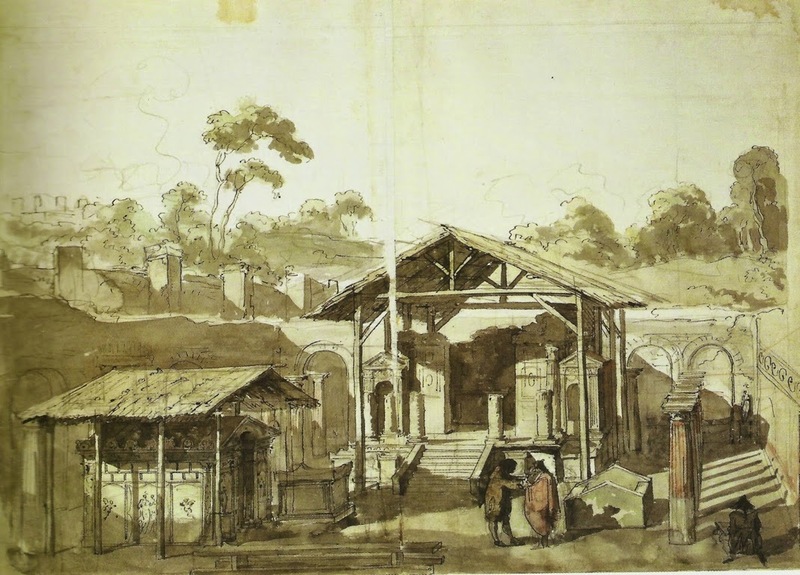 As we mentioned realism and realistic style, it is probably the right time to tell one of my favourite Iseum stories: the Disappeared Colonnade (and Wall). If you’re an artist grew up professionally with the myth of Ancient Rome as Neoclassicism disseminated it, then the Iseum is something particularly disconcerting to you. Too much colour, no marble, no symmetry. But, probably, the worse thing is that there is not enough room. All the elements are a bit too close. Again, not very “Roman”. 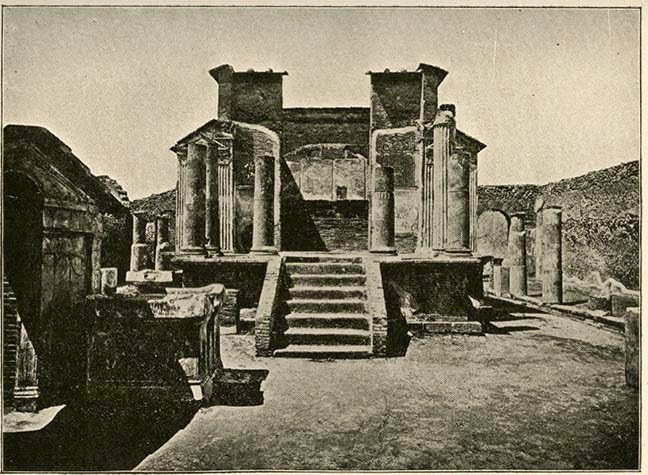 I cannot possibly say if it was due to disappointment or to the conscious attempt to support the cultural agenda that wanted Pompeii promoted as a “proper” Roman town, but what happens in the first representations of the temple is rather mysterious. In this image by Desprez (which is also, by the way, the only one showing temporary structures to protect the temple and the purgatorium) the buildings are drawn in a way that makes them look bigger and wider. Maybe to accommodate better the majestic procession of Isis cultists that were very popular in the virtual reconstructions of the time (Piranesi and Saint-non, in particular, were clearly very fond of Egyptian priests). The fact is that, to represent such a view (and make possible crowded and scenographic nocturnal celebrations), Desprez had to operate a little surgery on reality: he removed an entire row of big, doric columns. They are just gone. Vanished. And, with them, the massive east wall of the Iseum. In other words, he has changed the Iseum into a cinematographic set with only three sides (the fourth one left for the camera). 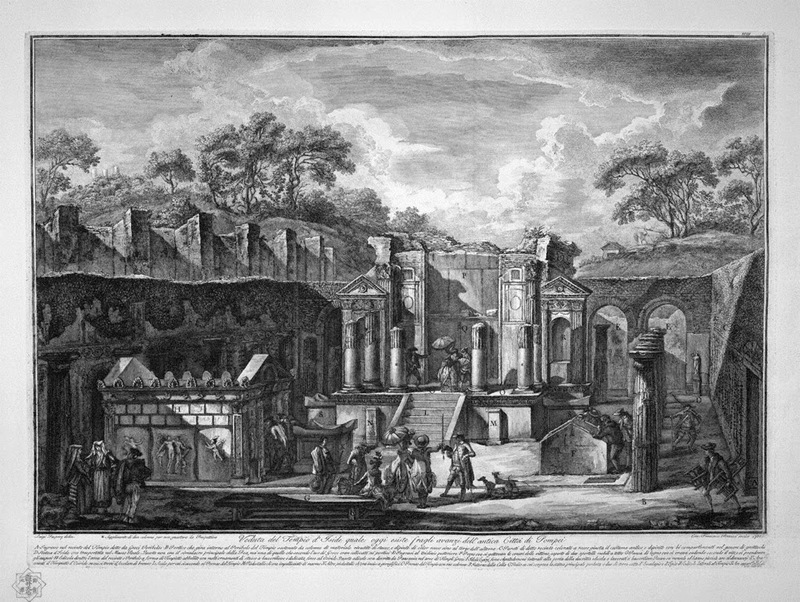 The same magic event can be seen in Piranesi drawings, as well (unsurprisingly, as Desprez was a big fan of Piranesi family’s work). Again, in spite of the realism of the scene that is, under other respect, quite faithful to the truth, the east side of the colonnade is gone. The lovely detail of the people congregating next to the Purgatorium, is geometrically impossible (there is barely room for a single person between the Purgatorium and the colonnade). So, this very realistic view is basically fake, it never existed. But of course, that didn’t stop people from copying and reproducing it. And just to remember that it is not a matter of technology, the advent of photography didn’t really bring more “objectivity”: it seems that photographer were trying to reproduce the same sort of views that had been already popularised through drawings, engravings, and postcards. Probably, because that is what the public was expecting to see in guidebooks and other publications about Pompeii. Thus, photographers tried to replicate the familiar view, forcing perspective a little bit to make the space look wider and, again, eliminating the columns from the frame. Who said that a photograph never lies?